Betty Bonham Lies is the author of three volumes of poetry and four other books. She is the senior poetry editor of US 1 Worksheets. 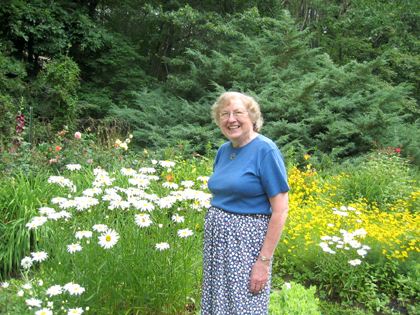 A Geraldine R. Dodge poet, she also teaches at the Princeton Senior Resource Center. It wasn’t until the late eighties when the Princeton Township resident was a seasoned teacher, that Ms. Lies re-discovered her muse. After inviting poet Lynn Powell into her English class at Stuart Country Day School and working together with her students on assignments set by Ms. Powell, Ms. Lies came back to poetry. Ms. Lies believes that “Poetry is an important discipline for children. It is the most precise use of language.” She has found that the close reading and attention to detail demanded of poetry benefits her students’ expository writing. Since 1996, Ms. Lies — who has a New Jersey Supervisor’s Certificate at Rider University and taught in both Michigan and Connecticut before moving to Princeton in 1961 — has been an Artist in Education for the New Jersey Writers’ Project. Named a Distinguished Teaching Artist in 2000 and in 2003, she has also earned the Governor’s Award in Arts Education and been awarded several fellowships from the National Endowment for the Humanities. Ms. Lies is a poet in the schools for the New Jersey State Council on the Arts, as well as a Geraldine R. Dodge Foundation Poet. As such, she goes wherever she is sent, traveling throughout New Jersey, primarily in Hunterdon County and to Voorhees in Camden County. Each year, however, she returns to Stuart Country Day School and now also to the Princeton Academy of the Sacred Heart. Fascinated by the connection between poetry and expository writing, she went to Columbia University’s Teachers College on a Klingenstein Fellowship to research the subject. Finding that very little scientific research had been then done on this, she produced instead a book for teachers of creative writing: The Poet’s Pen: Writing Poetry with Middle and High School Student. The book gave her a chance to work with her son Brian Lies, a children’s book writer and illustrator whose latest book Bats at the Beach was published recently. At the urging of Lynn Powell, then living in Princeton, she joined the U.S.1 Poets’ Cooperative, the nation’s oldest extant poetry group, which was founded by Alicia Ostriker and Rod Tulloss in 1973. Attending the weekly critique sessions kept her writing and eventually led to her founding, along with several other U.S.1 members, another group now known as Cool Women. Tonight at 7:30 p.m. in the Community Room of the Princeton Public Library, Ms. Lies will present her poetry with fellow poet Richard St. John as part of the U.S. 1 Poets Invite series.